Since 1993, Pete’s Gear Shop has been providing the highest quality service and repairs for foreign and domestic manual transmissions, drive trains, rear end differentials, brakes and more. Pete's Gear Shop has established a reputation for being the resource for that hard to find part and custom fabrication . 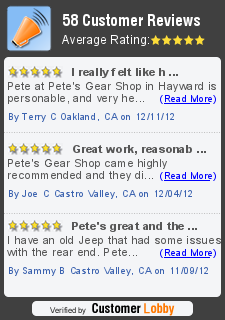 Pete's Gear Shop is recognized as the premier specialty auto repair shop in Hayward and the greater Bay Area. Copyright © Pete's Gear Shop. All Rights Reserved.